Aided by recent evolutions in drone technology, one area that is seeing unprecedented growth in Agriculture. The days of walking through fields to inspect crop yields are now almost over. Now drones can assist farmers in a range of tasks from analysis and planning, to the actual planting of crops, and the subsequent monitoring of fields to ascertain health and growth. With access to a live feed of what the drone camera is seeing, a single operator is able to cover more ground in lesser time. By using precise drone technology, farmers are able to optimize both farm productivity and profitability based on real-time field information. 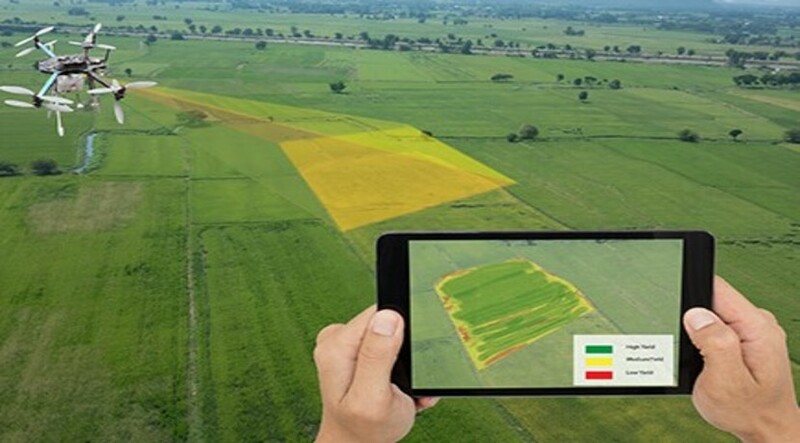 With a greater visual overview, farmers are able to have a greater perspective of the crop fields they are inspecting, thus leading to more efficient farming. Drone usage in the agriculture sector is a major industry, providing farmers invaluable information to increase profits and productivity while also decreasing their environmental impact. Soil & field analysis – soil sampling combined with drone mapping to give a better prescription for crop selection. Crop monitoring – currently, the agricultural industry’s largest obstacle is the low efficiency in crop monitoring resulting from the massive scale of industrial farming, exacerbated by increasingly unstable weather condition that intensifies risk and maintenance costs. Irrigation – drones equipped with hyperspectral, multispectral or thermal sensors are able to identify areas that require changes in irrigation. Health assessment – scanning crops with visible and infrared light, drones can identify which plants may be infected by bacteria or fungus, helping to prevent a disease from spreading to other crops. We provide innovative, sustainable, result driven solutions and services to agriculture, agribusiness, and food processing sector across the value chain. We use a georeferenced map and proprietary algorithms to differentiate between healthy and damaged plants across multiple plants across multiple plant types and growth stages. Farmers and insurers both benefit from applying advanced knowledge to damaged crops. Drones help farmers optimize the use of inputs such as seeds, fertilizers, water, and pesticides more efficiently. This allows timely protection of crops from pests, saves time for crop scouting, reduces the overall cost of farm production, and secures high yield and quality crops. The agriculture industry is quickly recognizing the advantages of time efficiency and affordability that drones provide to ultimately help assist in boosting crop yields and profits. With all of the rapid advancements in drone technology being made, we can confidently say that the future of drones in the agriculture sector is just beginning to take-off.